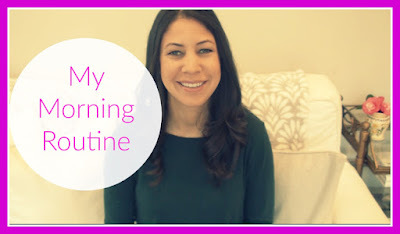 Today I am sharing my morning routine with you. Everyone has different life circumstances. Some people have children, others don't. Some people commute to work, and some work from home. Everyone has a different schedule. The important thing is to find a routine that works for you. The key word being routine. I believe a regular morning routine is key to starting the day off right. Of course things happen and we don't always adhere to our regular schedule, but having the foundational bones for a regular morning schedule works wonders on your day. 6:00am Wake up. I like to wake up before the rest of my family to have some quiet time and to get ready. 6:00am to 6:30am Time to wake up in a relaxing way: pray, read, check the news, drink water, take vitamin, cup of tea or coffee (normally coffee but I've switched to tea during the pregnancy). 6:30am to 7:00am I get ready for the day: bathe or shower, get dressed (easy with the ten-item wardrobe), le no makeup look, do hair and tidy up the bathroom/ make my bed. 7:00am to 7:15am Wake up the children. Help them get ready including brushing teeth, making beds, getting dressed, doing hair and putting away pajamas. 7:15am- 8:00am Give the children breakfast, make their lunches, eat my own breakfast, shoes and coat on. Out the door at 8:00am to walk to school. I always set the table for breakfast the night before and leave out waters for the children. I also set the lunch boxes out and place non-perishable lunch items in their boxes (I finish them off with the fresh items the following morning). Dinner Party Atelier lists Lessons from Madame Chic as one of the 5 most impactful books she's ever read and writes a wonderful blog post on using your best dishes on a daily basis. My Life in Snippets shares a Madame Chic triple review. I loved reading her takeaways from all three books. Blue Sky Kitchen is hooked by Madame Chic and has started to clear her clutter. Enter to win a luxurious set of Christy Linens, luxury towels and a copy of Polish Your Poise with Madame Chic on Christy's generous giveaway (for US residents only). Check out this interesting article in the Seattle Times, High cuisine, low manners: is proper etiquette dead? Sweet Caroline, I loved your story, which is so similar to my first disastrous dinner party. I am so happy you were able to recover and now enjoy the art of entertaining! This is amazing! I had no idea that other people experienced this same situation. I am 20 years old and graduated high school only a few years ago and that is when it was very difficult to accept people's comments on how I dress. I used to dress down to avoid the comments but I realized how much happier I feel when I look my best. I start to feel my best and do my best when I look on the outside how I feel on the inside! Dara, I am so pleased that you have moved past worrying about other's comments and have joyfully embraced looking presentable always. 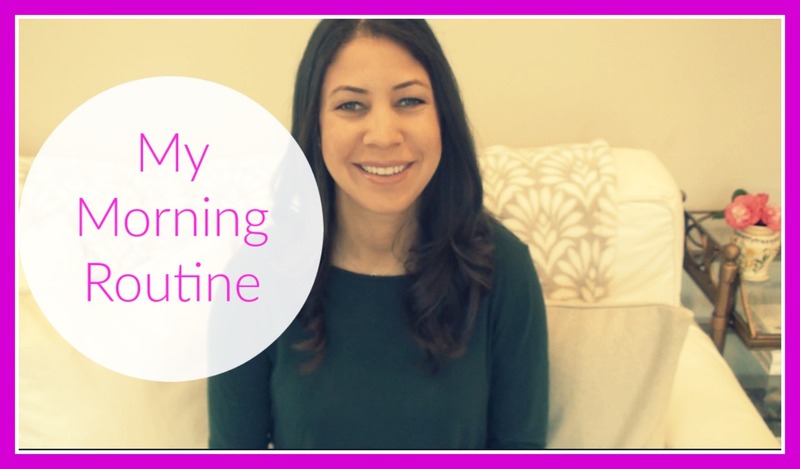 This week I would love to know... what is your morning routine? Do you start the day off feeling prepared or do you constantly feel like you are playing catch-up? What is your favorite part of the morning? Leave your comments below and you could be chosen as the comment of the week! I am so pleased to share another amazing giveaway from Christy Linens. 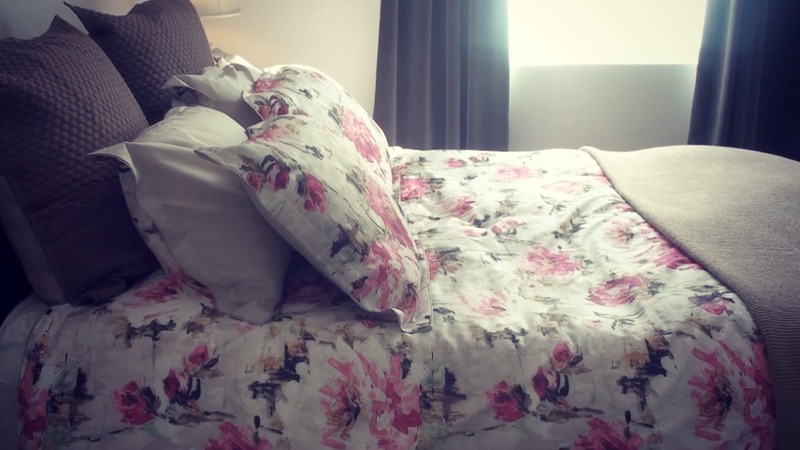 You will recall over a year ago we did a giveaway for beautiful cream bed linens and this time I take you into our guest bedroom to show you the bright and beautiful Julianne linens. 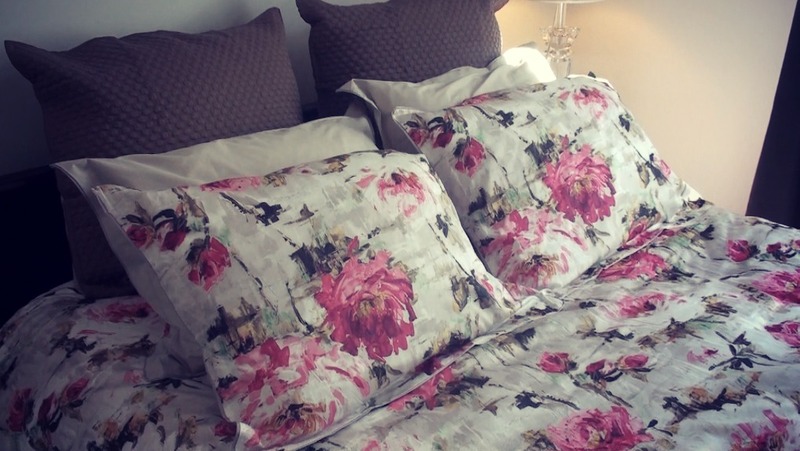 In addition to a copy of Polish Your Poise with Madame Chic, Christy Linens are giving away a complete set of linens of your choice: duvet cover, pillow shams, Euro shams and knit throw, as well as a complete set of Supreme Hygro towels to a reader of The Daily Connoisseur. What an amazing prize! The giveaway will run for one month and is open to US residents only (terms set by Christy linens). Enter the giveaway on Christy's website HERE. I wish you the very best of luck! I appreciate all of my readers so much. I wish you could all win this giveaway. Thank you for being loyal readers. And thank you to Christy Linens to offering this generous prize. FTC: The linens featured in this video were sent to me to review by Christy Linens. All opinions are my own. We held a simple dinner party on New Year's Eve and I shot a video to share our table with you. This one is much less formal than our Thanksgiving table and that was by design. I wanted a fresh and casual (yet elegant) look to the table. There is no tablecloth or runner this time, only the rattan place mats. For napkins, I use blue and white French provincial linen. Our plates are the large cream plates from Pottery Barn that we have had for ages. For flowers, I clipped some of the beautiful pink camellia blooms from our backyard tree. For Christmas, my husband gave me a beautiful silverware set from Williams Sonoma. 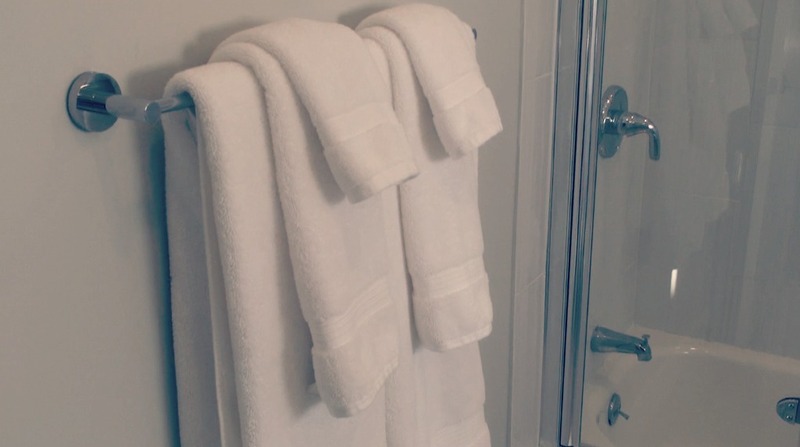 The handles are heavy with an antique look and the prongs are quite modern-looking. I love them! Because I set the table the day before, some of the camellia flowers had fallen, so I placed those fallen blooms in little dishes on the side of the vase. I hope you enjoy watching this week's video, which is a quick glimpse at our table. I hope this inspires you to throw a dinner party this year. Don't let entertaining intimidate you! I always set my table the day before so I don't need to worry about it the day of. I knew that I would receive many congratulations for our baby news, but was overwhelmed in such a positive way with the large outpouring of comments and well-wishes. Thank you so much! You are all the comment of the week for me. I love my readers and feel so grateful for your love, support and interest. Thank you! Jennifer, thank you for sending out the message that while we should do the best we can in any endeavor and try to improve as we go along, we do not have to live in limbo until we achieve perfection. From your charming Thanksgiving table to your lovely musical performances, you demonstrate that we can delight others even without the air-brushed, edited and unrealistic depictions that are common in popular media today. So many of us struggle with the burden of feeling 'not good enough'; I am sure you have helped many of your readers and followers to overcome this. Hi Gail, as I mentioned in my New Year message, I will never promote a "pinterest-perfect" message because that is not realistic and it's not everyday life. Also, it's not important to have everything be perfect. What is important is that you do what you do passionately and with love. So if the napkins don't match and there are some missed notes on the piano, that's OK, it's the spirit behind these endeavors. Thank you for picking up on this and for your articulate email. Knowing of your fondness for Angela Lansbury, I wanted to ask if you've ever seen the made for television movie she starred in based on the novel, Mrs. 'Arris Goes to Paris? I saw it way back in 1992 when it was made, and fell in love with it. Recently I was delighted to find the novel by Paul Gallico and am enjoying it so very much; but between the mental association with Angela Lansbury and the Paris connection, I think of you every time I open the book. Finally, just had to write and mention it. Hi Nancy, I have not heard of this movie or book before, but knowing how much I adore Angela Lansbury and how much I adore Paris, it seems right up my alley! Thank you for the recommendation. Have a wonderful weekend, Daily Connoisseurs. As always, I love to read your comments so leave your thoughts below. See you on Monday for my freezer lasagna video. Hello dear Daily Connoisseurs and happy new year! I am feeling refreshed and invigorated after my blogging break and ready to embrace 2016 and all that it has to offer. This will be our third child and I am due at the end of June. This is such happy news for our family. We are really thrilled to be welcoming another child. Our daughters are very excited and always want to prepare for the baby coming. Thank you in advance for your well-wishes and I look forward to sharing more with you as time goes on. I have many exciting videos and topics to share with you in 2016. I know I was supposed to be on a break during the Christmas holiday, but I did shoot two videos, which you will see in the coming weeks- one showing my new year's eve table setting (a special bonus video this Thursday) and one sharing my large batch cooking video for freezer lasagnas. Please leave any requests you have for the new season of The Daily Connoisseur below in the comment section. I always love to hear what interests you. 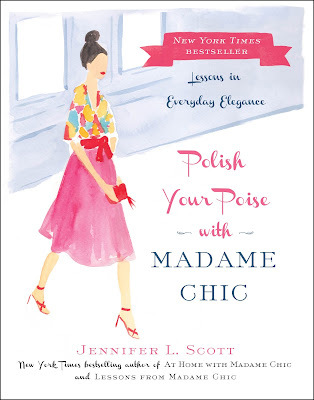 Carrie Willard chooses Polish Your Poise with Madame Chic as one of her favorite books for 2015. Kaitlin Olson, editorial assistant at Simon & Schuster and someone I work closely with on the Madame Chic books, has written a wonderful tribute to her grandmother, which is featured in the New York Times this week. Congratulations Kaitlin! What can I say? At last- a set of books that fully outline and codify some of my deepest and longest held life concepts, written out and explained so much better than any other I've ever been exposed to in my life. I've always had as one of my deepest desires and as one of my basic core beliefs, the desire and necessity to "live beautifully". Although I've always had some kind of notion as to what this means, those notions have always proved to be much too vague for me to be able to put them into actual practice. I can't tell you the life-changing information, as well as pleasure, l've gained from from reading your books. My entire concept of living beautifully- there it all is! Outlined and expanded on paper, and with specific details as to how to put everything into practice. This is a "big thing" for me, as heretofore the means for implementing my lofty objectives has always eluded me. I now have a set of many concrete steps I can take, and the reasonings behind those steps .......all wrapped in encouraging words and messages designed for each. Most of my life I have wanted to make a positive contribution, to leave "a life legacy".....with my lacking in specific strong skills and talents, however, I could never envision in what manner I could ever hope to achieve this type of objective. However, after reading about the importance of poise in our world and the positive impact to our world and to others provided by regular exposure, I now have a sense of hope, as well as a sense of a mission in life- especially living in a culture bleak with vulgarity and coarseness. I am not one to write authors...but the need to let you know the impact your writings have made on me was placed on my heart......especially as that impact is fairly significant. I CAN' T wait to continue cultivating poise on an ongoing basis- it is providing me with both a great measure of pleasure, and more meaning to my life as a whole. Ha! Maybe one of these days I'll pick up blogging, if only to document the changes I make as I implement your suggestions, as well as the impact of any of those changes, as time progresses! Karen, thank you for sharing your testimonial with us. I love to hear how the Madame Chic books have impacted peoples' lives. I hope you continue to enjoy the process and take great pleasure out of living a beautiful life. Remember to leave your requests for 2016 (or questions for upcoming reader questions answered videos) in the comment section below. See you Thursday for a special bonus video!